Just wanted to say a well done to your team on Sunday morning. I was over for the swimming race on Saturday and had breakfast Sunday morning. The team were all very good and the food was excellent . Please pass on a big well done to them all. the 3 days of our conference. that much better. The food was very tasty, varied and heaps of it! I received nothing but positive feedback and will certainly recommend you to everyone. 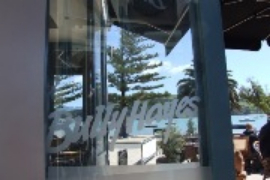 ARE YOU A REGULAR CUSTOMER AT BULLY HAYES? Get discounts on food and beverages. Apply for a card below.